It was a hard manoeuvre, certainly. Maybe, with hindsight, even unfair. But it wasn't malicious. No one of sound mind is deliberately going to drive into another racing car at the best part of 180 mph. No, when Vincenzo Sospiri moved across to claim the inside line for the first corner in Barcelona, he simply made a small error of judgment, which sent the nose fin of Fabrizio de Simone's Reynard into orbit. The stewards decided it was no more than a standard racing accident. De Simone pitted for a new nose, and would later spin off. Sospiri kept the win, his first in Formula 3000. His second would follow three weeks later, in Pau. In three races this year, his worst result has been a second place, at Silverstone. 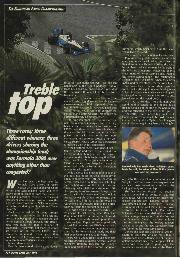 He has already accrued 24 points, matching the 1994 tally which earned him fourth place in the championship. It is the best start a driver has ever made to the FIA F3000 series. And Super Nova has made the best-ever start by a team, thanks to debutant Ricardo Rosset's victory in race one, at Silverstone. Given that the championship is to be replaced in 1996, these records will stand for all time. Of course, you expect Sospiri to be fast. It is his fourth full season in F3000, and he has spent three of those in top drawer equipment. So how come his first victory was so long in the making? "You have to remember," he says, "that in each of the last two seasons I had a good car, but I was driving for new teams, and this isn't an easy formula for a new team to come in and start winning straight away. Super Nova has been strong from the start, but now everybody has got a year's experience, and we're putting it to good use." He might also have added that the team had signed both its drivers early during the close season, and that it accrued plenty of testing miles. Testing and Sospiri are not, however, always willing bedfellows. Indeed, only days before his Pau victory, Sospiri had been the best part of two seconds slower than teammate Rosset, during a test at Monza. "Getting Vincenzo motivated for testing has never been easy," admits Super Nova director David Sears, "but I think he's basically got over it to a degree. "I'm trying to make him treat every test session as an Fl test, as if his future depended on it. Last year, when he had a run in the Simtek at Barcelona, his first experience of F1, he was on it straight away. "It's a question of taking the trouble to understand the animal, and then doing what you have to get the best out of him." That is something Sears appreciates better than most. He has already salvaged Sospiri's career once, way back in 1990, when he took the then 23 year-old Italian on for a season of Formula Vauxhall Lotus. His career was at a difficult stage. Sospiri had taken an unusual route, spurning his native Italy after winning the world karting title in favour of a season of British Formula Ford. 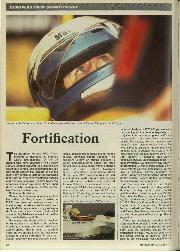 He placed third in the national championship, and drove quite brilliantly at Brands Hatch to win The Festival. Formula Three beckoned, but it didn't work out. Sospiri wasn't comfortable. He was seldom competitive. He had to take a Step back. He guided his new protégé to the British Vauxhall Lotus title and second place in the Euroseries. 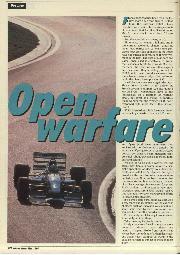 Sospiri was back on the rails, and he graduated directly to F3000, as Damon Hill's team-mate at Barclay Team EJR. He gave a good account of himself, too, in a season when the team was plagued by the less than competitive Lola T91/50 chassis. 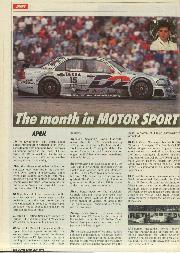 He finished second at Hockenheim, but the year was marred by events in the seasonal finale, at Nogaro. Hill was the team leader, but Sospiri had scored a couple more points. All the same, when the team hired a Reynard for the final race, to satisfy itself that their relative lack of form was material-related, it was Hill who got to drive it. The change of chassis proved a point. Hill ran a comfortable third, and was challenging for second place when he came up to lap his team-mate. Overturning the normal order of things. Sospiri allowed the rival car to pass, but blocked Hill. Indeed, the Englishman was forced to take to the grass. Then, at the end of the main straight, where Hill tried once again, around the outside, Sospiri simply drove straight on. Hill was forced to do likewise. The two drivers just sat in the escape road, Hill staring across incredulously. The words 'team and 'mate' did not spring to mind. Hill found reverse, and went on to finish third, but he was not in terribly good humour afterwards. And nobody was blaming him. Sospiri, meanwhile, had been spirited away as quickly as possible. The incident certainly sullied his reputation. He was forced, for the second time, to take a retrograde step. Italian F3 appeared to be little more than a cul-de-sac. 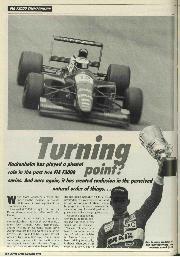 When he returned again to F3000 in 1993, with the nascent Mythos team, most people regarded it as too late. He'd had his chance. Results, predictably, were solid, but still he couldn't win a race. With money available from a Japanese sponsor, and looking to found a strong new team in 1994, Sears could pick whomsoever he wished. He could have chosen David Coulthard. 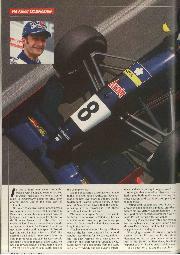 Proven F3000 winner Gil de Ferran was available. Sospiri is no longer in the first flush of youth. He will be 29 this October but, as his former team-mate Hill has proven, experience is no bad thing if and when you do make it to the top grade. "We are talking closely to a couple of good F1 teams," says Sears, "and I think you'll see him doing some testing before the end of the year." 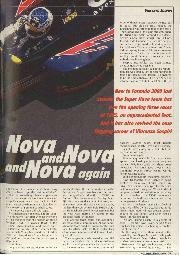 In the longer term, there remains the possibility that Super Nova will itself graduate to Formula One. Indeed, feasibility studies have already been conducted.